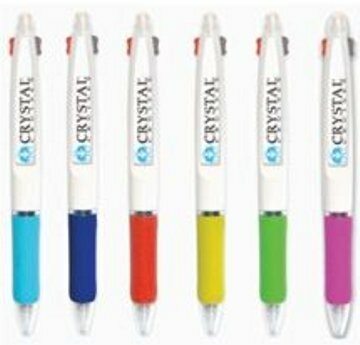 2-color pen with a .5mm mechanical pencil conveniently housed in a single product. Offered in white only with your choice of either blue and red refills or red and black ink refills. Choose from blue, green, red, yellow, pink or light blue trim. Pens are bulk packed. Budget Prices in USA and Canada for wholesale personalized triple function pens. Unit prices below include your 1 or 2-color custom imprint. Estimated Production time: 7-10 days after art approval. Please contact us for faster delivery. Blank triple pens ship next day. Imprint Area: 1-1/2" x 5/16"
Packaging: Bulk. 1000 pens per carton of 26 lbs.